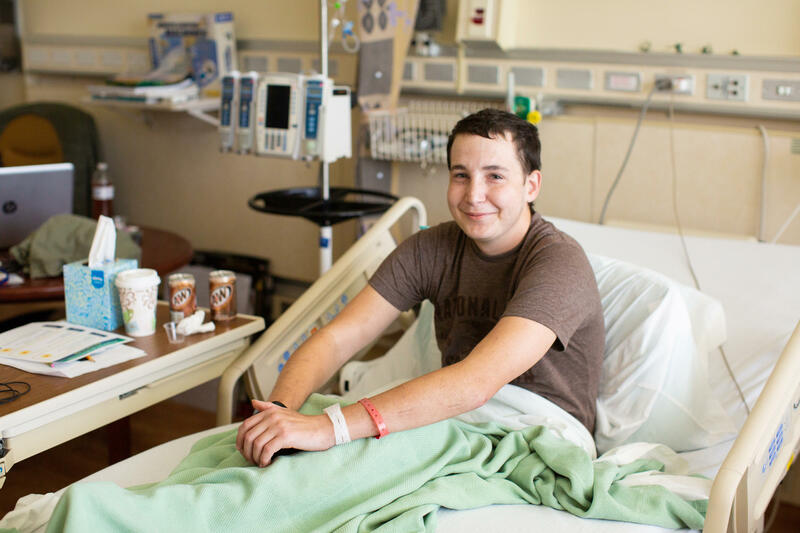 Patient Aaron Reid receives (CAR) T-cell therapy at the NIH in Bethesda, MD. The process took five minutes to complete. 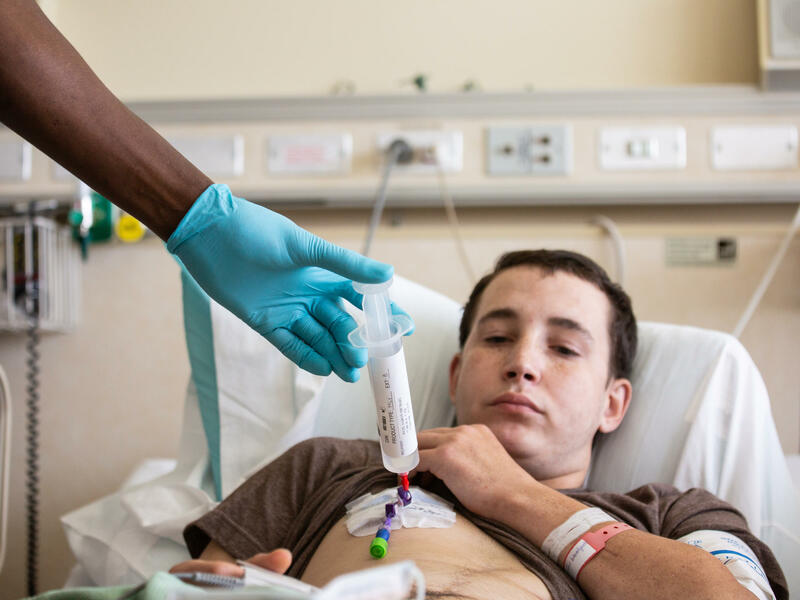 Aaron Reid, 20, prepares to receive treatment for his leukemia with CAR-T cell therapy at the National Institutes of Health Clinical Center in Bethesda, Md. 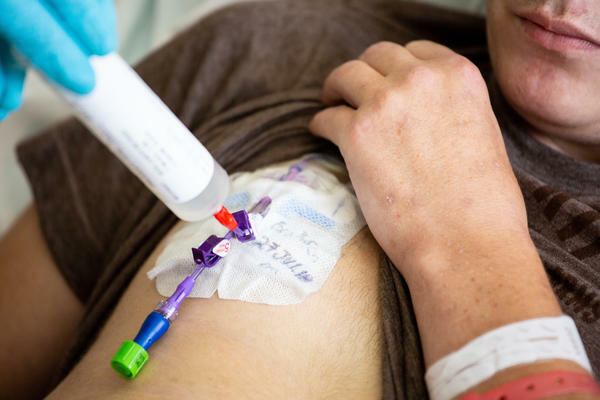 The infusion of CAR-T cells for Reid took about five minutes to complete. 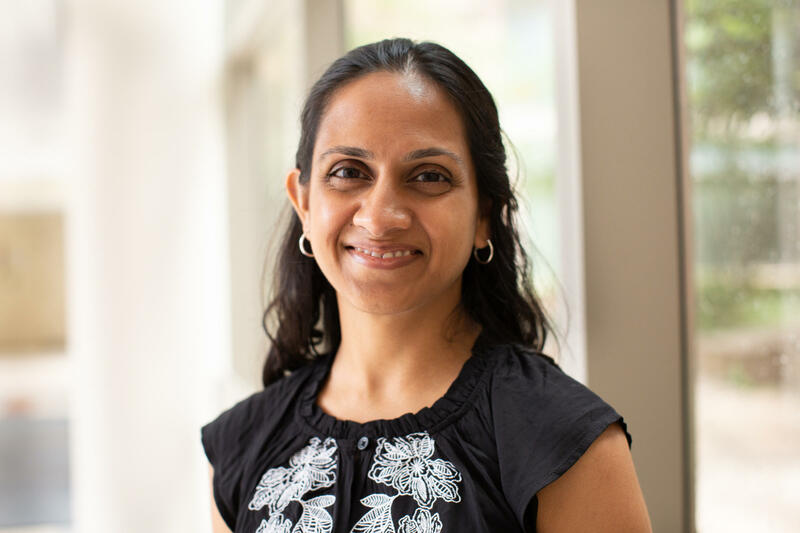 Dr. Nirali Shah, an associate research physician at the National Institutes of Health is leading a study that includes Aaron Reid. Reid has been fighting leukemia since he was 9 years old. He remains optimistic about the new treatment. Aaron Reid is lying in a hospital bed at the National Institutes of Health Clinical Center when doctors arrive to make sure he's ready for his experimental treatment. "How's your night? Any issues?" asks Dr. Katherine Barnett, a pediatric oncologist, as they begin to examine Reid. Reid, 20, of Lucedale, Miss., has been fighting leukemia since he was 9 years old. He has been through chemotherapy and radiation twice, a bone marrow transplant and two other treatments. But the leukemia keeps coming back. This time, the cancer is all over his body. He can feel the pain in his bones. He's in Bethesda, Md., for what could be his last hope. "The big plan for the day: Get the cells," says Dr. Andrea Gross, another pediatric oncologist. The cells are an experimental version of a relatively new cancer therapy called CAR-T. These CAR-T cells are sometimes called "living drugs" because they are engineered from patients' own immune system cells. "I think it's amazing that they can find a way to use someone's own ... cells," Reid says. "Take out their own cells, teach it to do something and then put it back in them, and to be able to heal them. I think that's amazing." The engineered cells are made by extracting T cells — a key part of the immune system -- from each patient's blood and then genetically modifying them in the lab. The T cells that are created carry structures on their surface called chimeric antigen receptors, or CAR for short. Those receptors enable the cells to zero in and attack cancer. "What we're doing is we are educating [the T cells] to say, 'These things don't belong,' " says Dr. Nirali Shah, a pediatric oncologist at the National Cancer Institute who is running a study Reid is in. " 'You need to get rid of them. Yes, I know that they started in the body. But they're not supposed to be there. You need to attack.' "
Once the cells are infused back into a patient's body, they take on a life of their own, increasing their numbers in proportion to the cancer in the body, Shah says. "It's an army that multiplies when it has a bigger job to do," Shah says. "It's a living drug. It multiplies in the body." CAR-T therapies are among the most exciting developments in cancer research in years — one of several approaches that harness the immune system to fight cancer. "It's been a phenomenal success," Shah says. The Food and Drug Administration has already approved two CAR-T therapies. The first was for children and young adults suffering from acute lymphoblastic leukemia, which is the most common cancer among children. The agency subsequently approved a second CAR-T therapy for adults with a form of lymphoma. But these "living drugs" are far from perfect. They're very expensive, costing hundreds of thousands of dollars for each infusion for each patient. "These are amazing drugs. But these are prices that we really haven't seen before," says Dr. Peter Bach, who directs the Center for Health Policy and Outcomes at Memorial Sloan Kettering Cancer Center in New York. "It's just astonishing how comfortable people have gotten with treatments costing these astronomical sums." The treatments can also be dangerous, sometimes triggering what can be a life-threatening reaction by the immune system. Another significant issue is that CAR-T cells may not work very well on some of the most common solid cancers, such as tumors of the breast, lung or prostate. "The first attempts to apply CAR therapy to solid tumors, which I found premature, have not been very impressive," says Dr. Michel Sadelain, a leading CAR researcher at Memorial Sloan Kettering. And even for leukemia and lymphoma, the cancer often comes back. That's what happened to Reid after every treatment he tried, including another form of CAR-T.
"Leukemia is smart," Shah says. "Our therapy is really good. But the leukemia has found a way to outsmart our really, really exciting therapy. And so we have to find a way to attack it differently." Scientists around the world are doing hundreds of studies to try to improve the CAR-T strategy. Some are trying to create off-the-shelf CAR-T cells that won't have to be made individually for each patient. That approach is being developed to make them much easier to produce and much less expensive. Shah's team is testing an experimental CAR-T approach designed to reduce the risk of a recurrence. Her team is modifying patients' T cells to recognize and attack two targets unique to leukemia cells instead of just one. The two CAR-T treatments approved so far have been engineered to target just one. The hope is that adding a second will reduce the risk of a relapse. "One of my patients calls it the one-two punch," Shah says. "Maybe we can really get at the leukemia and prevent one of those leukemia cells from outsmarting the immune therapy — get rid of each and every single one so that there's no chance for even one of those little buggers from escaping and coming back at a later time." In preparation for Reid's infusion, technicians in a lab at the NIH hospital pull open a huge metal tank and slide out his genetically engineered cells. After testing, checking and rechecking the cells, they fill a large plastic syringe with 17 million of Reid's tailor-made cells and rush them to his room. Once there, the nurses confirm one more time that they've got the right cells for the right patient. They take Reid's temperature and check his blood pressure. "I just wanted to check in — make sure there are no any additional questions," Shah says. "Let's get it over with," Reid says. The nurse leans over Reid holding the syringe with his cells. He inserts the tip into a tube that was placed in Reid's chest earlier and begins squeezing the plunger. As the cells slowly drip into Reid's body, the nurses watch his vital signs to make sure he's not having a bad reaction. And after about five minutes, it's done. Reid's doctors will now monitor him closely for the first signs the treatment is starting to work. Within a few weeks, the CAR-T cells should kick into high gear and cause his immune system to explode like a storm, Shah says. "The first hint of a fever and achiness and things like that, we get really excited because it means the storm is coming," Shah says. "But along with the storm, it means that the cells are getting activated and they are going to start doing their job." That storm, technically known as cytokine-release syndrome, can be extremely intense, and sometimes it's life-threatening. But doctors have learned how to manage the reaction in most patients, Shah says. "So now we wait," Shah whispers almost to herself as she heads back to her office. "This is all kind of really exciting stuff. Don't know what's going to happen," he says. "Hopefully, it works." There's been a really exciting advance in the war on cancer with the help of what scientists are calling living drugs. They're made by genetically modifying patients' own immune system cells. And today NPR's health correspondent Rob Stein brings us the story of how doctors are trying to save terminally ill patients with these living drugs. KATIE BARNETT: Good morning. How you doing? 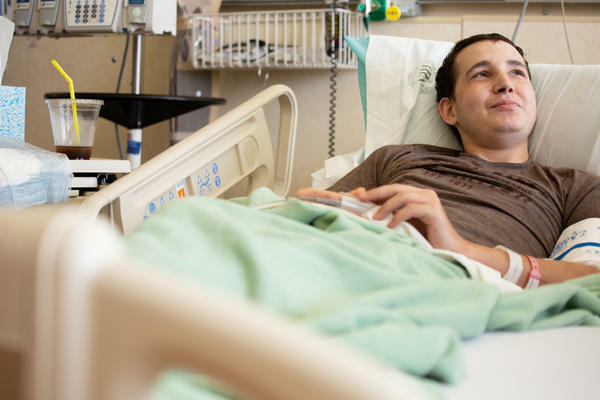 ROB STEIN, BYLINE: Aaron Reid is lying in a hospital bed at the National Institutes of Health when doctors Andrea Gross and Katie Barnett stopped by for their daily check-in. BARNETT: How was your night? STEIN: Aaron is from Lucedale, Miss. He just turned 20. He's been fighting leukemia since he was 9. GROSS: Take a deep breath in - and out. In. Out. OK, good. STEIN: Over the years, Aaron's been through two grueling rounds of chemo and radiation, a bone marrow transplant and more. But the leukemia just keeps coming back. This time, the cancer's everywhere. He can feel the pain on his bones all over his body. REID: I had to take some pain meds earlier. GROSS: So we do hope that that's going to get better with treatment. STEIN: Aaron's pretty much run out of options. So he's here today to try another treatment, an experimental treatment that could be his last hope. BARNETT: Your numbers today, they all look good. The plan is to go ahead and do the cell infusion today. Any questions right now? GROSS: The big plan for the day - get the cells. STEIN: The cells are the treatment, his own immune system cells. The doctors pulled them out of his blood and genetically modified them in the lab. REID: I think it's amazing that they can find a way to use someone's own - you know, take out their own cells, teach it to do something and then put it back in them and - to be able to heal them. I think that's amazing. AUTOMATED VOICE: Third floor - going down. STEIN: While Aaron waits for his cells, I head downstairs to find out more about how these living drugs work. STEIN: Hi, Dr. Shah. It's Rob Stein from NPR. SHAH: Nice to meet you. Dr. Nirali Shah is in charge of Aaron's study. She says scientists genetically engineer the immune cells to recognize and attack unique targets on the cancer cells. SHAH: So what we are doing is we are educating them to say these things don't belong. You need to get rid of them. Yes, I know that they started in the body, but they're not supposed to be there. You need to attack. STEIN: But that's not all. Once the cells are back in a patient's body, they take on a life of their own. SHAH: It's an army that multiplies when it has a bigger job to do. STEIN: Oh, wow. So they - you put them back in the body. And they look around and say, oh, it's a lot of these guys in here. We need more of ourselves. And they reproduce and kind of swarm the cancer? SHAH: That's exactly right. It's a living drug. It multiplies in the body. STEIN: These living drugs are already saving the lives of kids and younger adults who would otherwise die of leukemia and adults who would otherwise die from lymphoma. SHAH: This is incredible. It's been a phenomenal success. STEIN: But these living drugs are far from perfect. They're really expensive, can be dangerous. No one knows if they work on the most common tumors, like breast cancer, lung cancer, prostate cancer. And even for leukemia and lymphoma, the cancer often comes back. That's what happened to Aaron. SHAH: Leukemia's smart. Our therapy is really good, but the leukemia has found a way to outsmart our really, really exciting therapy. And so we have to find a way to attack it differently. STEIN: So scientists around the world are doing hundreds of studies to try to make better living drugs - more affordable, safer, more powerful. Shah's team is testing an approach that genetically modified Aaron's cells to go after two targets unique to his leukemia instead of just one. SHAH: One of my patients called it the one-two punch. STEIN: So it's sort of like a double whammy. SHAH: That's exactly right. Maybe we can really get at the leukemia and prevent one of those leukemia cells from outsmarting the immune therapy and get rid of each and every single one so that there's no chance for even one of those little buggers from escaping and coming back at a later time. STEIN: And that's why Aaron Reid is here today, to try this new double-whammy living drug. STEIN: In a lab at the hospital, technicians pull open a huge metal tank and slide out Aaron's cells. SHAH: Patient - Reid, Aaron Michael - seven, seven, eight, eight, three, two, zero. STEIN: After testing, checking and triple-checking the cells, they fill a huge syringe with 17 million of Aaron's tailor-made living drugs cells and rush them to Aaron's room. UNIDENTIFIED TECHNICIAN: All right. So where's this going, 3 Northeast? UNIDENTIFIED TECHNICIAN: All right. Cool. SHAH: I'm going to give the nurse a heads-up that you are coming. UNIDENTIFIED NURSE #1: Hi. Ready? STEIN: Once the cells arrive in Aaron's room, the nurses confirm one more time that they've got the right cells for the right patient. UNIDENTIFIED NURSE #2: So I have Mr. Aaron Michael Reid. UNIDENTIFIED NURSE #1: So state your name. STEIN: While they take his temperature and check his blood pressure, Dr. Shah makes sure Aaron's ready. SHAH: I just wanted to check in, make sure that there are no additional questions. REID: No, pretty much answered anything I ever had. Let's get it over with. STEIN: The nurse leans over Aaron's bed holding the huge syringe with his cells and inserts the tip into a tube in his chest. UNIDENTIFIED NURSE #2: I'm infusing the cells right now. These are the cells. STEIN: As the cells slowly drip into his body, the nurses watch Aaron's vital signs to make sure he's not having a bad reaction. UNIDENTIFIED NURSE #2: Everything looks perfect right now. STEIN: After about five minutes, it's done. UNIDENTIFIED NURSE #2: It's completed. Feeling OK? STEIN: Aaron's doctors will now watch him closely, looking for the first signs the treatment is starting to work. Within a few weeks, Dr. Shah says his genetically engineered cells should kick into high gear and explode like a storm. SHAH: The first hint of a fever and achiness and things like that, we get really excited because it means a storm is coming. But along with the storm, it means that the cells are getting activated, and they're going to start doing their job. STEIN: In most cases, it's like the worst flu you've ever had. It can get really bad, though, even life-threatening. But most patients get through it. How are you feeling right now? REID: Still pretty excited - this is all kind of really exciting stuff. You know, don't know what's going to happen. And hopefully, it works. STEIN: The room gets quiet for a moment. Dr. Shah whispers to me as she gets ready to head back to her office. SHAH: So now we wait. Rob Stein, NPR News, Bethesda, Md. (SOUNDBITE OF DIAMIN'S "PERCEPTIONS") Transcript provided by NPR, Copyright NPR.